Because the sweet potatoes roast and caramelize in the olive oil and liquids from the parsnips and the carrots that make their way to the bottom of the dish/pan. I would totally eat this for lunch. Or even dinner. But I made it to be a starchy-vegetable side dish served along side some simple baked chicken. Would be delicious with steak and pork chops too! Preheat oven to 400. Spray a 9×13-inch glass baking dish with non-stick cooking spray. Peel and chop all the veggies into 1/2″-ish size pieces. Place them in the baking dish and toss together. Drizzle with olive oil. Tuck the rosemary stems around the veggies. Roast in the preheated oven for 35-40 minutes, tossing once after about 25 minutes. 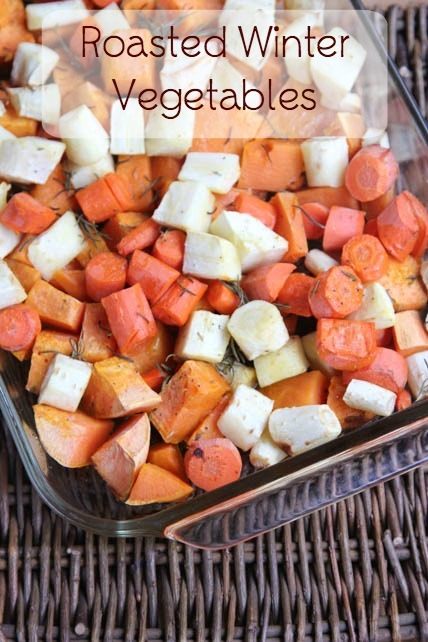 Serve Roasted Winter Vegetables as side dish or main dish. You always give such great, simple recipes. Love the 5-ingredients. And roasted root veggies are perfect this time of year. Yum! Olive oil is not mentioned in the directions. I assume you just drizzle it on before roasting. This looks good, and I plan on trying it soon. Thanks! Oops – we’ve updated the post. Thanks! If I was to add Brussel sprouts, when should I add them in, since they take less time to cook, in your expert opinion?